2) The Game (i.e. the acceptance of the world in the books as real). Crazy people who think Sherlock Holmes is real. She became one of those crazy people. What made Sherlock Holmes into the man we know? With today’s obsession with recreating the origin stories of comic book heroes, that does not seem a strange question. It was then. While there had been some semi-biographical books written about Holmes, including Baring-Gould’s, and there were more to come none really explored that question. Her answer to it, The Crack in the Lens was a novel, not a mystery, because the crimes that occur in it are not solved, thus becoming the spur that drove Sherlock Holmes to become the detective that Old Trevor thought he could be. 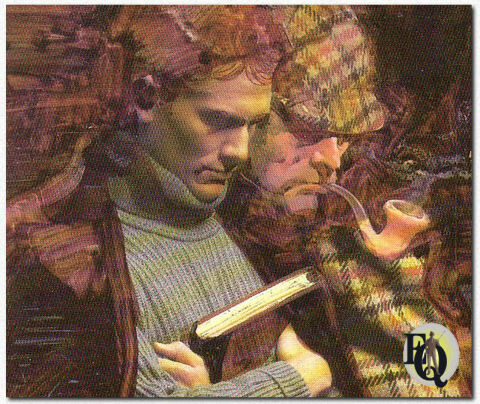 She realized as The Crack in the Lens was completed that there was more of Holmes’ story to tell before he met Dr. Watson, and shortly thereafter realized it could not fit in one book. Thus was born The Consulting Detective Trilogy. Part I: University and Part II: On Stage are available and Part III: Montague Street will be available in late 2018 or early 2019. Above: Detail from the cover of the Italian edition for A Study in Terror, Oscar Mondadori, 1988. 2) The Game. She's convinced introducing both could go a long way towards the goals for Ellery Queen mentioned on this website. After re-reading her collection of Ellery Queen books she once gain found herself facing a nagging question, a story that had to be told. She's not going to reveal that question yet, because it will give away the plot of a book she's writing, beyond saying that it is NOT the same question she's had about Sherlock Holmes. 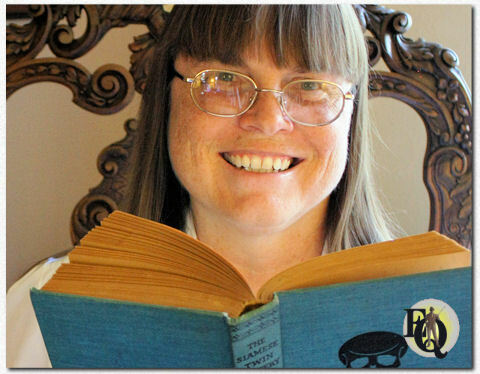 As Darlene describes herself: "My method of fleshing out a Canonical world is different from writing a pastiche. The result may be a mystery or detective story, or maybe not. It might be a novel without a solution or it may be a biography covering a number of cases in a detective’s life including multiple mysteries and solutions. Reconstructing a world is much more time consuming than writing a pastiche. It requires reading and rereading the books and taking copious notes of little details of the lives of the characters, many of which the average reader might not notice. It also requires adopting a chronology of the Canon based, not solely on the publication date, but the internal clues recorded in the books. In the case of Ellery Queen it is a challenge to determine what constitutes the Canon. I will leave the complete answer to that question for another day. For my current work I decided that I only needed to determine the chronology of the first nine books, which constitute what Francis Nevins called the first period." Subsequently she offered that piece of work to this site. So you're able to enjoy it below. This is a chronology of the first nine Ellery Queen books. Those are The Roman Hat Mystery through The Spanish Cape Mystery, sometimes referred to as the first period. By “chronology,” I mean the order, the year, season, month and sometimes the actual dates the cases expounded in the books actually occurred. This chronology does not include any of the short stories, novellas, radio scripts, or screenplays (television or feature film). For simplicity I have adopted an abbreviation of each of the books as indicted the chart below. Ellery Queen writes fiction. Therefore, some stories could be fiction. Use this rule with caution. To construct the chronology I used a spreadsheet with a number of columns holding different types of data from each book. I began with the stories in publication order. Based on the data in the cells, I shifted the order of the stories and establish a place in the chronology. Some of the data was straightforward: Title, Publication Date, Season, Date References, Order References (mention of previous cases), and inclusion of Duesenberg, Djuna, or Inspector Queen. Other information is unique to each story and was accumulated under “Notes.” Another factor that is difficult to nail down is the general historical context which can help place a story or a series of stories in their proper time. These can include dress, vehicles, technology, social policy (e.g. prohibition, suffrage), local and world events (e.g. Great Depression, Wars) and a great many other things. Unfortunately, most of the stories treat Prohibition as if it did not exist. Consumption of alcohol is common and except for the mention of a “speakeasy” in American Gun, no reference is made to Prohibition. Yet assuming that the cases occurred before Prohibition (<1920) or after (>1933) does not work. They cannot start afterward because Prohibition ended in 1933 and all but the last two were published in 1933 or earlier. They cannot all have occurred before Prohibition began in 1920 because that would place the cases out of sync with other technology and social customs mentioned. The only real solution is to assume that the people involved had so little regard for Prohibition that they totally ignored it in their daily lives. That is not entirely unbelievable. This might be the most controversial step I took in constructing this chronology, but it should not be. I have discarded the introductions by J.J. McC, not only because the biographical data in them is inconsistent with the continuing saga of the Queens (i.e. the Queens could not have retired before 1929 as written in J.J. McC’s Foreword to Roman Hat and still had adventures set in the 1930s, 40s, and 50s) but are even inconsistent with the first nine tales themselves. If J.J. McC actually existed, J.J. McC explained that himself in Roman Hat when he wrote that Ellery insisted that their identities be hidden. What better way to hide identities, but to manufacture false and inconsistent biographical information? However, I suspect J.J. McC never existed at all, but was a tool used by Ellery. The “Preparatory: Spectrum” and “Postlude: Spectrum Analysis” in American Gun are good illustrations. They purport to be discussions between Ellery and J.J. McC near in time to the events of American Gun. That is chronologically inconsistent with the Forewords in the previous books. The purpose of those two sections in American Gun seems to be more to fill in a gap when Ellery was unable to finish the tale by his preferred method of gathering the people involved and explaining how he solved the crime and revealing the perpetrator. In this case he could not do so without revealing the murder’s motive which he would not do. Instead Ellery used a fictitious conversation with J.J. McC as a “wrapper” to the actual events. Regardless of whether J.J. McC existed and conspired with Ellery to muddle the timeline or whether Ellery made him up, it is impossible to make any chronology of the first nine tales based on their internal data that is consistent with the J.J. McC introductions and therefore under Rule 5, I discarded them. Siamese Twin has to be after Egyptian Cross and Spanish Cape because Egyptian Cross and Spanish Cape both feature the Duesenberg that is destroyed in Siamese Twin. Egyptian Cross is years after Ellery went to college. The Duesenberg was probably bought and refurbished in 1930 or later with income from books sales. Egyptian Cross has to be from December 1931 to June 1932 based on reference to June 22 being a Wednesday (See discussion of Egyptian Cross). Spanish Cape takes place after Labor Day and probably in 1932. Therefore, Siamese Twin must take place in the summer of 1933 and thus 1873 is also the earliest year Richard Queen could be born. Ellery’s birth year is not as simple. We have a reference to him being younger than 30 in French Powder, but most of the other indications are more subtle. Yet I am happy with the birth years of Ellery and Richard Queen. With a birth year of 1900, Ellery is 22 at the time of Greek Coffin, 27 in Dutch Shoe, French Powder and Roman Hat, and ages from 31-33 in Egyptian Cross, Spanish Cape, American Gun, Siamese Twin and Chinese Orange. Richard Queen starts as 49 in Greek Coffin and ages from 56 to 60 in the following cases. I will discuss Djuna’s birth year more under American Gun. Both Greek Coffin and Dutch Shoe state that they took place before Roman Hat. Egyptian Cross and American Gun both mention the Roman Hat case which requires them to occur after Roman Hat. Roman Hat cites Monday, September. Since Roman Hat was published in August 1929, Rule 1 requires that the case occur before 1929. A perpetual calendar shows that the nearest years before 1929 in which September 24 falls on a Monday are 1923 and 1928. The most logical year is 1928. French Powder is mentioned in American Gun and thus must have occurred before American Gun, which is positively dated as occurring in late 1932. Since French Powder was published in 1930, it must have occurred before 1930. The first year before 1930 in which May 24 is a Tuesday is 1927. The narration states that Ellery “looked 30 but was younger.” That comment suggests that Ellery was just a few years under 30. If Ellery was born in 1900 then he would be 27 in 1927. Dutch Shoe was published in 1931, but claims to begin in January 192- Therefore the case cannot have begun later than January 1929 or earlier that January 1920. Given that it has to be sometime after Greek Coffin, but before Roman Hat, January 1927 seems the most rational time period. The text of Greek Coffin claims that the case occurred shortly after Ellery graduated from college and a number of years before Dutch Shoe, Roman Hat, and French Powder. Given the greater level of maturity of both Ellery and Djuna in those later cases, I hypothesized that there was at least five years between Greek Coffin and Roman Hat. There is a significant chronological problem with the dates Thursday October 7 and Friday October 8. Those dates fall on those days of the week in 1915, 1920, and 1926 according to the perpetual calendar. The years 1915 and 1920 seem too early to have been after Ellery graduated from college unless his birth date was shifted earlier than 1900. A case year of 1926 places this case too close to Roman Hat, which takes place in autumn cannot be any later than 1928 since it was published in August 1929. Having Greek Coffin only two years before Roman Hat does not seem to justify the mentions of how much younger Ellery and Djuna were. Therefore, either the dates or the days of the week, or both, must be wrong. Egyptian Cross was published 1932. It cites December 29 as a Tuesday, January 2 and a Saturday and June 22 as a Wednesday which means it started in December 1931 but mostly takes place in 1932, because the alternatives are 1921, which is too early, or 1927, which would place it before Roman Hat rather than after. Also if we assume that Ellery bought the Duesenberg with money from the publication of Roman Hat and French Powder in 1929 and 1930 respectively, it would have to be after 1930. The number of years since college suggests around a decade since graduation. It is not clear what day the case begins on. It is after Christmas Day, but before Tuesday December 29th when Inspector Queen leaves for New York. There needs to be time for the murder to reach the Chicago newspapers and for Ellery and the Inspector to drive to the scene. Monday December 28 is a reasonable choice. Egyptian Cross occurs before Siamese Twin because it features the Duesenberg (battered old racing car) which was destroyed in Siamese Twin. Note that the Duesenberg is refurbed racing model, not a normal production line model as some have speculated. That means it probably was originally built sometime between 1914 and 1927, and purchased by Ellery when it was long in the tooth and he was flush from a book sale, most likely in 1930 or 1931. American Gun is set a number of years after Ellery graduated from college due to its reference to how long it had been since Ellery had last participated in nightlife. American Gun refers to the Dutch Shoe, French Powder, and Roman Hat cases, which means American Gun must follow them. However, what really dates this case is Curly’s war record and birthday. In Chapter 2 it says Curly signed up for the American Expeditionary Force when he was sixteen and fought at St. Mihiel which was the first battle of Pershing’s troops and took place on September 12 – 16, 1918. That means Curly must have been born in 1902. In Chapter 16 Curly celebrates his thirtieth birthday. That means this case took place 14 years after the battle of St. Mihiel or in 1932. American Gun was published in 1933. We only know it is winter because it is cold outside. Initially it seemed American Gun must be in late 1932 or it would overlap with Egyptian Cross. However, when I discovered the gun issue, I realized Egyptian Cross and American Gun MUST overlap. In American Gun, Ellery is unfamiliar with automatic guns. An NYPD expert teaches him about automatics. In Egyptian Cross, Ellery HAS an automatic in the Duesenberg! American Gun must occur in the gap in Egyptian Cross sometime between Ellery’s return to New York in January and warmer weather. American Gun states that Djuna is 16 in Chapter 2. We do not know which month the Queens celebrate Djuna’s birthday so he could be 15-16 or 16-17 in 1932. (In truth, none of them probably knows what Djuna’s real birth year was so we can only go by what Richard and Ellery perceived it to be.) If Djuna was really 16 at that time of American Gun and we accept 1922 as the year for Greek Coffin then Djuna was indeed very young during Greek Coffin. He would have been 5-7 years old. That also suggests that he was adopted when he was somewhere between 1-5 years old. As improbable as that sounds, is not impossible. In addition, that would mean that Djuna was about 17 during the two cases Siamese Twin and Chinese Orange that take place the following year. It may explain why he soon thereafter vanishes from the record as he begins a life of his own. I would lean towards Djuna being 16-17 in 1932, being about 7 in Greek Coffin and being adopted at about 5 years old. The Duesenberg is definitely destroyed in the fire because the explosions of the cars in the garage are mentioned. That places it after both Egyptian Cross and Spanish Cape which feature the Duesenberg. The Duesenberg is mentioned as a racing relic Ellery had picked up years before. Since Spanish Cape takes place after Labor Day and Siamese Twin takes place in the summer, Siamese Twin must be the year after Spanish Cape. It was published in 1933 and thus cannot be any later than 1933. Chinese Orange takes place in the autumn. Ellery is fairly famous which means it is after 1930. Djuna goes to the movies and runs errands, which means he is older, as opposed to staying home in Roman Hat. That also suggests a later date. Ellery’s fame is sufficient in this case that it must be after 1930. It features the Duesenberg which means it must pre-date its destruction in Siamese Twin. The Duesenberg is mentioned as having “once been a famous racing car.” The mystery takes place beginning after Labor Day. Ellery claims to have rescued judge from the ocean in Maine 6 years before but I am not sure how that fits with anything.